As the hardreading staff noted yesterday, a cabal of tree-huggers called Consumers for Sensible Energy has been running this ad in the Boston Globe. But #StopThePipelineTax has so far been a bust, drawing “No Results” a day after the group’s first ad ran, and only this a day (and another ad) later. So, to recap: One-half of the responses to this six-figure ad campaign have come from . . . us. Consumers for (All Those Dollars and No) Sensible Energy has scheduled a State House rally at 11:30 today. Is #StopThePipelineTax Already Out of Gas? An outfit called Consumers for Sensible Energy ran this ad in the Boston Sunday Globe yesterday (but not the Boston Herald). Last Week, Kinder Morgan announced that it has suspended its Northeast Energy Direct pipeline project to import fracked gas from Pennsylvania to New England and to connect to export terminals in Canada for shipment overseas. That was great news, but it is only half the story. There is a second pipeline company proposing to import more fracked gas. And, once again consumers would pay for the $3 billion cost, with a monthly pipeline tax on their bills. Spectra Energy has proposed its Access Northeast project, which would expand and add new pipeline from West Boylston to Weymouth and down to Acushnet. It calls for the construction of a massive liquefied natural gas facility and new compressor station on the South Coast and South Shore. Among the Bad News Bearers about the other half of the story was this Globe piece last week. Mayor Robert Hedlund says he’s talking to Spectra Energy about a mitigation package involving millions of dollars for the town if the company builds a natural-gas compressor station near the Fore River Bridge — despite his opposition to the project and calls from local residents to stop the talks. The offer calls for a $12 million payment in the fall of 2016, followed by another $1 million annually for the next 14 years, and potentially more in property tax adjustments, according to Hedlund’s office. Hedlund said attorneys for the town advised him that the Federal Energy Regulatory Commission did not appear to be swayed by Weymouth’s concerns that the compressor station posed a safety threat — and would probably approve Spectra’s plans soon. The federal agency has ultimate authority over the project. Understandably, Consumers for Sensible Energy wants to mobilize the opposition quickly, so its website billboarded this. Ever diligent, the hardtweeting staff checked #StopThePipelineTax on Twitter and here’s what we found at 12 o’clock this morning. Just to be clear: 18 hours after their five-figure Boston Globe ad hit the front doors of 220,000 Greater Bostonians, Consumers for (Dollars But No) Sensible Energy had generated up to zero responses on social media. All due respect, but what the frack? The faulty (but still fáilte) local tabloid is giving the umbrage-industrial complex a bad name. 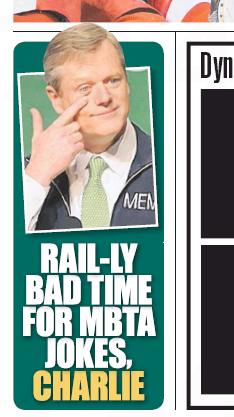 For the second day in a row, the Boston Herald is mewling about the so-called jokes at this year’s St. Patrick’s Day breakfast. Gov. 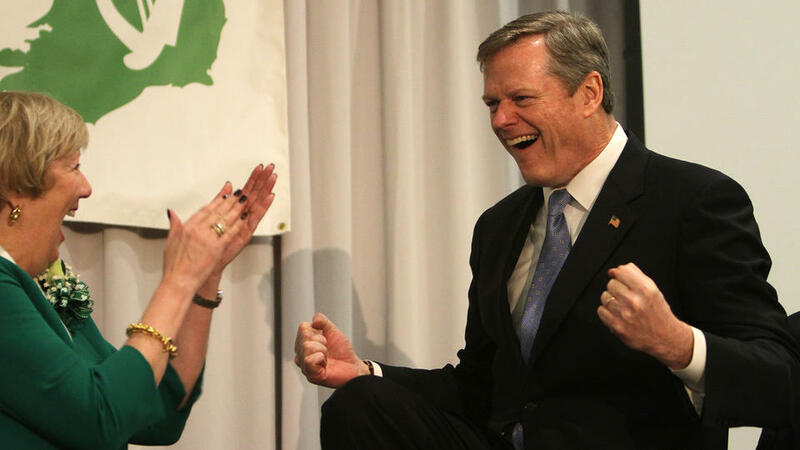 Charlie Baker’s appearance alongside embattled MBTA General Manager Beverly Scott in a skit goofing on the transit system’s winter woes got a chilly reception from some who say it runs counter to Baker’s image as a reformer of the troubled authority. “I think it would be prudent to try to avoid making a joke out of it,” said David Tuerck, executive director of the Beacon Hill Institute, who noted that the commuter rail is still operating on a reduced schedule. Gov. 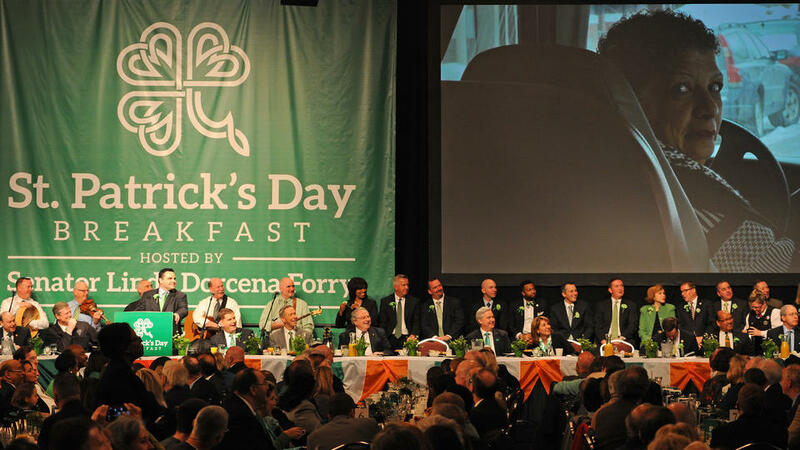 Charlie Baker is standing by his MBTA skit at South Boston’s St. Patrick’s Day Breakfast — and doubled down last night at another holiday dinner in Lowell, where he mocked the transit agency’s dysfunctional commuter rail line. Baker drew some chuckles at the St. Patrick’s Day fete in Lowell, when he joked that during the height of the storms he would be told a number of commuter rail engines were ready to go the next day — only to see that number shrink the following morning. “I was like, what are these things, teenagers? ‘I got up this morning, Dad looked at me kind of funny. I was out drinking last night. I’m sorry.’ … I wish I was kidding, but the simple truth is the main reason we had so much trouble with the commuter rail is because inside those big, brawny locomotives beats the heart of a 16-year-old,” Baker said. The frosty local tabloid also got chilly about some gag props. Santa Clara University Law School professor Margalynne Armstrong found the joke inappropriate for the state’s top lawwoman. Really, where are they finding these folks? Regardless, new motto for the Herald: Erin Go Blah!